Schladming is a charming Alpine resort in Austria. Situated in the region Styria this mountain village is attractive for summer vacationers as well as skiers in winter. Once a thriving mining place delivering silver, zinc and ore in the middle ages, it became a tourist place in 1865 when the first train drove through Schladming. 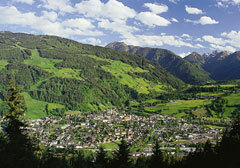 In 1953, the first ski lift was built and since then Schladming has become a well-known ski resort. Various skiing competitions such as the FIS World Cup Men Nightrace are regularly held in Schladming. In summer, hikers will find perfectly groomed trails and get a refreshing bath in more than 300 mountain lakes. The mountains are not just beautiful to look at but a challenge for climbers. Outdoor activities are a must in this beautiful landscape and fresh air is guaranteed.